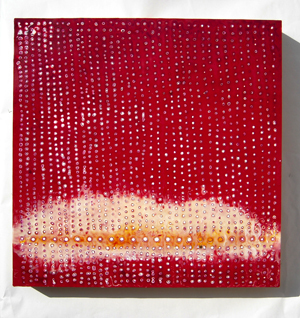 Sinopia is proud to introduce our February 2011 Artist of the Month: Eileen P. Goldenberg. Eileen was born in Brooklyn NY. She has called herself an artist since the age of 5, and has a lived in San Francisco for over 35 years. She holds a BFA, MA and MFA in art. 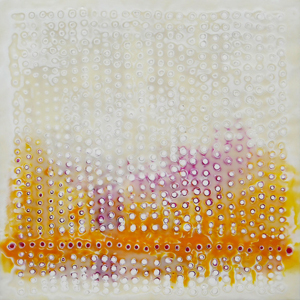 Encaustic on Panel, 24" x 24"
She uses encaustic paint, (a medium made of pigments suspended in a molten mixture of beeswax and damar resin.) 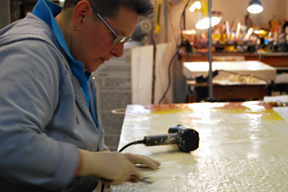 The luminous, translucent quality of encaustic has allowed her to develop a system of painting that is unique. Her newest works are in the Landing and the Array series. 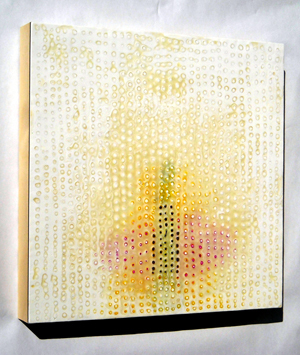 Encaustic on Panel, 18" x 18"
Artist's Statement: My paintings explores material, color and space by combining ordered, repetitive elements with visual texture and translucency, taking full advantage of encaustic's ability to tease the eye, simultaneously revealing and concealing. I paint organically, letting my emotions lead the way, literally feeling my way into each piece. 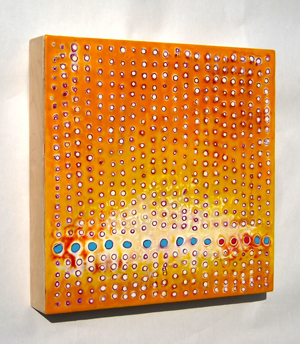 Encaustic on Panel, 12" x 12"
The thousands of tiny orbs seem at first to be identical, but like humans, they are in fact all distinct and individual. Look closely and you can see the razor sharp outlines that contrast with the soft blending of luminous subtle color. I meticulously add layer upon layer of molten wax, submerging feelings that will later be revealed, giving them a life of their own.